Nico Rojas notched a 19 points, seven rebounds and four blocks. Antonio Sims scored 15 points and got 3 rebounds. Jeffrey Hernandez and Kenneth Santos scored 13 points each. The Seahawks outrebounded Florida National 40-37 in the contest. The opening ten minutes of the contest proved to be difference as the Seahawks were unable to rebound. Florida National controlled the opening ten minutes of the game as they held a 23-10 advantage. The Conquistadors led by as many as 37-19, before the Seahawks closed the half on a 10-5 spurt to get within 42-29. Keiser trimmed the margin to 47-36 on an Orlic layup but Florida National responded back with a 9-1 run to extend their advantage to the largest of the game, 56-37 with 13:35 left in regulation. The Seahawks fought all the way back to single digits, 81-74, but FNU scored the final seven points of the game, prevailing 88-74. The Conquistadors pulled down 15 offensive rebounds which led to 24 points. 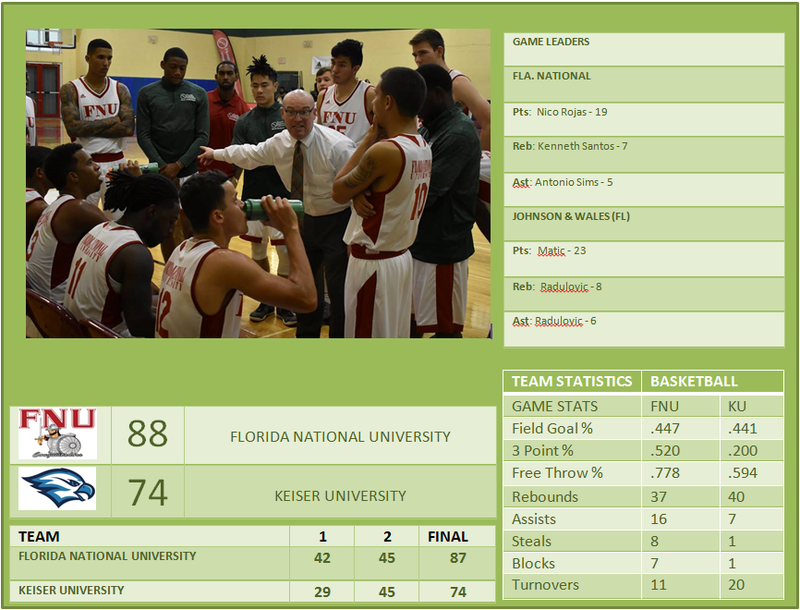 FNU improve its record to 4-4. The Conquistadors will face Lynn University on Friday evening at Boca Raton with a tipoff of 7:00 p.m.